From ancient times, foreign civilizations would enter Japan through northern Kyushu. Not only the civilization of ancient to medieval China and Korea, both much more sophisticated than Japan at the time, but also the Catholic powers of Spain and Portugal in the 15th century and the Dutch in the 17th to 19th century, all first reached Japan at the shores of Kyushu. Even in Imperial Japan, during which technological innovation, starting with steamboats, rendered such geographical specifics to relative insignificance, the proximity of Kyushu to the mainland of Asia greatly influenced the geo-strategic thinking of the leaders of the Empire. This has not changed even in the present time, with Fukuoka prospering thanks to its strong ties to the vibrant East Asian economy which seems likely to keep growing in importance through the 21st century. Kyushu, and Fukuoka in particular, is the window for Japan to see the outside world. In this exhibition, the Tokugawa Shoguns themselves became the window that enable the audience to get a glance of Tokugawa Japan. The martial nature of the shogunate was shown in the flag, the armor and the swords, some of which were actually used by Tokugawa Ieyasu, the pacifier of Japan and the founder of the Shogunate. The civil nature of the regime was shown in the drawings and calligraphy by the subsequent Shoguns. Many items were from the last days of the Shogunate. The belongings and the works of Tokugawa Iemochi, the 14th Shogun, who had to confront a national crisis in his teens, and Tokugawa Yoshinobu, the 15th and last Shogun, who made enormous efforts to avoid a full-scale civil war, along with those of the Shogunal Consorts that supported them in both private and public spheres, were presented. Also, it was our intention in this exhibition to show the strong ties that the Shogunal Household had with Kyushu. Several of the Shogunal Consorts came from the Daimyo Households of Kyushu, while several Shogunal Princesses wed into those houses as well, and wares and artworks from those Households played an important role in the exhibition. 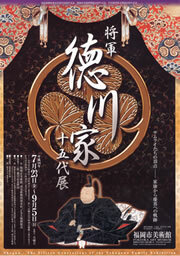 Some 54,000 people visited this exhibition.